With proper education and training, food borne illnesses and food service injuries can be significantly reduced. To assist in this process, DayMark offers a line of Education & Training products. Food Safety Posters are a simple way to inform employees about proper FDA and USDA procedures. 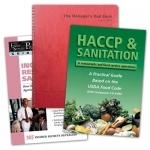 Covering a range of relevant topics such as controlling food costs and HACCP codes, Food Safety Books are another helpful Education & Training tool to have available in a restaurant.